Halloween isn’t all just about trick or treaters or spooky costumes. Traditionally, it’s when we tell each other ghost stories. 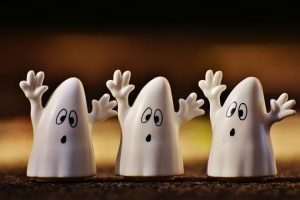 When it comes to business, though, none of us want to be haunted by the ghosts of data past. This is especially true now that the General Data Protection regulation is in force, and businesses face fines of up to 4% of their worldwide annual turnover, or 20 million Euros, whichever is the higher, when there is a serious data breach. Here are 5 ways your data could come back to trip you up. Wanting to recycle paper is a noble thing. We all want to save the planet. Yet, putting confidential waste in the general office recycling could be a huge mistake. Do you know where your recycling ends up and who has access to it? Identity thieves are adept at getting snippets of information from documents and piecing them together to use against you. Using a secure shredding company such as Taclus Confidential which vets its staff and has secure processes means your documents won’t fall into the wrong hands. Your paperwork will also be recycled at the end of that process. Wiping your hard drive doesn’t destroy the data on it. Instead, it removes a directory. For people who understand the technology, getting files back is still possible. So, when you’re upgrading laptops and PCs, it’s vital that your hard drives are shredded. That way, your data remains safe. Think about the kind of information you have in your business. That could mean staff medical records, notes of disciplinary meetings, financial information about employees, detailed business plans showing things about your business you don’t want competitors to know. Just placing these in an open bag while you wait for them to be disposed of could be a real problem. Imagine who has access to your site, and who could take information from those open bags. Getting secure consoles to protect that information is vital. Think about the flash drives, image cards, and SIM cards your business uses and what kind of information is on them. Files, pictures, emails…they all need protecting and could cause you major problems if they fall into the wrong hands. If you refresh your branding, items containing the old version could be used to defraud your clients or damage your business. That could be headed paper, business cards, and uniforms. If you shred them, you know they aren’t out there to be used against you.